Short-time work, also called short-time compensation, is a public programme targeted at firms facing temporary negative shocks. The design aims to reduce job destruction by subsidising firms to reduce hours of work and provide earnings support to workers facing lower hours. 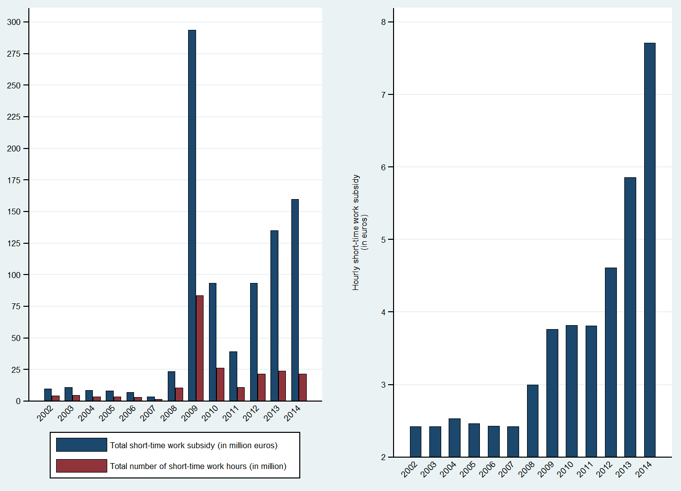 Short-time work can avoid job destruction (Boeri and Brueker 2011), but at the cost of distorting the number of hours worked per employee downwards (Burdett and Wright 1989) and the allocative efficiency of labour market (Cooper et al. 2017). In many systems, firms facing seasonal fluctuations in their revenue can make recurrent use of short-time work. This issue has been neglected by researchers, who have focused on short-time work when firms face temporary shocks. This issue is important, however, because sectors affected by seasonal fluctuations have strong incentives to lobby to benefit from short-time work schemes that would allow recurrent use of short-time work. This is exactly what has happened in France where, before the 2008-2009 recession, the short-time work scheme was very limited, with a budget fluctuating between €5 and €10 million per year. In 2009, the budget expanded to about €300 million, induced both by an increase in the demand from firms in distress and also by the government, which raised short-time work subsidies and made then easier to access to sustain employment. At the time, a government report (Brunet et al. 2009), co-directed by three representatives of large firms and one civil servant, recommended expanding short-time work beyond the end of the recession. In January 2012, when the recession was over, employers’ organisations and trade unions signed a national agreement to enlarge the programme further, and to raise the subsidies. This national agreement was implemented by decrees enacted to raise the budget devoted to short-time work. As a consequence, from 2013, the expenditure on short-time work was has been about 20 times larger than its pre-recession level (Figure 1). Notes: The data cover mainland France excluding Corsica; market sectors excluding agriculture; firms using short-time work for economic reasons. The hourly short-time work subsidy is defined as the total short-time work subsidy divided by the total number of short-time work hours. Sources: DADS (Insee), Sinapse (DGEFP) and Extranet (ASP). Obviously, short-time work is a means to keep employees in their jobs if it induces small costs to the employers. This is an inefficient way to provide insurance, however, as it entails cross-subsidies towards short-time work users that reduce aggregate production. Nevertheless, this is the path taken by French reforms after the recession, under the pressure of industries which could prospectively benefit from the short-time work subsidies. Our recent research (Cahuc and Nevoux 2017) uses detailed information about all short-time work subsidies from 2002 to 2014 to show that this increase in public expenditure primarily benefited large firms which have been using short-time work recurrently to deal with seasonal activity fluctuations (Figure 2). 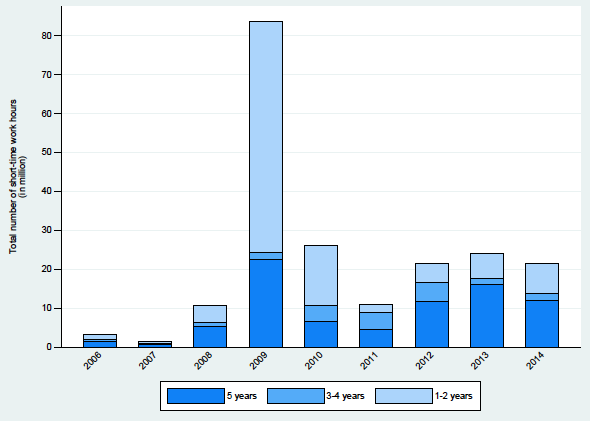 We present a model that shows that this expansion of short-time work induces cross-subsidies towards recurrent short-time work users, which reduce aggregate production. Our model shows that an efficient policy should instead provide unemployment insurance benefits, which would be funded by experience-rated employers’ contributions. In the unemployment insurance scheme with experience rating, employers could lay off workers during unproductive periods, but would have to pay for the induced cost to unemployment insurance. This system would induce employers to internalise the costs of their layoffs and incentivise them to keep their employees during unproductive periods to avoid increasing unemployment insurance contributions (Feldstein 1976, Blanchard and Tirole 2007, Cahuc and Zylberberg 2008). We conclude from our model that the production loss associated with short-time work, compared to a system of unemployment insurance with experience rating, is about 50% of the total amount of short-time work subsidies that are targeted at recurrent short-time work users. Note: “5 years” stands for the systematic users, whose consumption spans the last 5 years; “3-4 years” stands for the repeat users, whose consumption spans 3 to 4 years in the last 5 years; “1-2 years” stands for the occasional, or non-recurrent users, whose consumption spans 1 to 2 years in the last 5 years. Sources: DADS (Insee), Sinapse (DGEFP) and Extranet (ASP). Scope as before. These results suggest that short-time work programmes and unemployment insurance should be designed carefully. In all countries in which short-time work exists, the hourly benefits paid to employees for each unworked hour represent a fraction of the hourly wage. In many countries,1 employers pay a portion of the benefits and the other part is financed by public subsidies. In Italy and in the US, the benefits are entirely financed by public subsidies, but experience-rated social contributions mean that employers will have to pay back a fraction of the short-time work cost through higher social contributions in the future. And in Belgium, Canada, Denmark, Finland, Ireland, Spain and Turkey, employers bear no short-time work cost at all. Our results stress that systems where employers contribute little to short-time work induce firms facing strong seasonal revenue fluctuations to make recurrent use of short-time work, which reduces aggregate production. Given that, it is important to limit the recurrent use of short-time work. An effective way to achieve this objective may be to rely on an experience-rated system, in which employers have to pay back a fraction of the short-time work cost through higher social contributions in the future. This system would allow firms facing short-term financial constraints to sustain employment without inducing cross-subsidies that reduce aggregate production. Since the introduction of experience rating in short-time work reduces its attractiveness for employers, it induces a reduction in the short-time work take-up rate. This means the system should be complemented by mandatory unemployment insurance with experience-rated employers’ contributions to insure workers. From this perspective, more research is needed to gain a better understanding of the optimal way to integrate short-time work and unemployment insurance in a dynamic context with imperfect capital markets, in which employment can be adjusted at the intensive and the extensive margins. Blanchard, O and J Tirole (2007), “The Optimal Design of Unemployment Insurance and Employment Protection: A First Pass”, Journal of the European Economic Association 6(1): 45-77. Boeri, T and H Bruecker (2011), “Short-time Work Benefits Revisited: Some Lessons from the Great Recession”, Economic Policy 26(68): 697-765. Brunet, S, P Dorge, J-P Geneslay and M Biehler (2009), “Activité Partielle de Longue Durée : Prévenir les Licenciements et Préparer l’Avenir”, Rapport du Groupe de Travail, Secrétariat d’État à l’Emploi. Burdett, K and R Wright (1989), “Unemployment Insurance and Short-Time Compensation: The Effects on Layoffs, Hours per Worker, and Wages”, Journal of Political Economy 97(6). Cahuc, P and S Nevoux (2017), “Inefficient Short-time Work”, CEPR Discussion Paper 12269. Cahuc, P and A Zylberberg (2008), "Optimum Taxation and Layoff Taxes", Journal of Public Economics 92: 2003-2019.
Cooper, R, M Meyer and I Schott (2017), “The Employment and Output Effects of Short-Time Work in Germany”, NBER Working Paper No. 23688. Feldstein, M (1976), “Temporary Layoffs in the Theory of Unemployment”, Journal of Political Economy 84: 937-957. Hijzen, A and D Venn (2011), “The Role of Short-Time Work Schemes during the 2008-2009 Recession”, OECD Social, Employment and Migration working paper 115. Austria, Czech Republic, France, Germany, Hungary, Italy, Japan, South Korea, Luxembourg, Netherlands, New-Zealand, Norway, Poland, Portugal, Slovakia and Switzerland (Hijzen and Venn 2011). The employers’ participation in short-time work might be subject to specific conditions (differentiated schedule of payment, short-time work duration, establishments’ or firms’ size, training, collective agreements).